East Anglia is not short of ruined and lost churches, but mostly they are in wild and unloved places. This ruin is rather unusual. 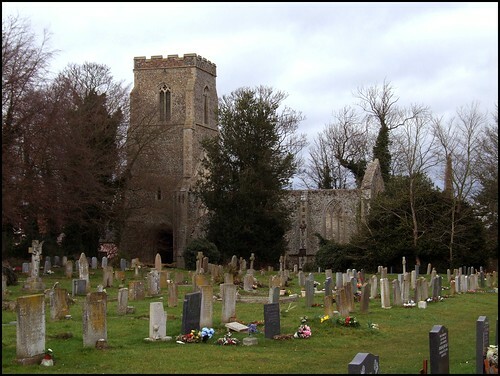 The graveyard is still in use, and we are on the edge of a large village which is almost a small town. The ruin has been deroofed, and the doors are gone, but otherwise it is intact. Although one wouldn't go as far as to suggest that picnickers frequent the former nave, it certainly is a nice place for a stroll, and no ruined church in the county can be easier of access. Cars storm past on the busy Bury to Diss road, and unless you approached the ruin up the long avenue of modern gravestones, you might not even realise that it is no longer a working church. Stanton has two churches. All Saints, the other, is smaller and less interesting. But it is half a mile away in the centre of the village, and since the Reformation these churches have not had separate worshipping communities. They have shared a priest since the 1550s, and the parishes were united in 1756. St John, although renovated in the middle years of the 19th century, does not seem to have been used regularly after that. It acted as the parish church when All Saints underwent its considerable restoration, and again when the tower there fell in 1906. It was derelicted in the early sixties, and is now in the hands of the Churches Conservation Trust. The churchyard sits almost completely to the south, and St John presses against its western boundary. There is no sanctified ground beyond. Because of this, it was necessary to have a processional archway beneath the tower, for the annual Corpus Christi procession, and other ceremonials. You can see the same thing at St Lawrence, Ipswich, and also at St Peter Mancroft in Norwich. This is a very good tower, and quite a landmark on the Bardwell road. It had four bells, one of which is now in the campanile tower at St Francis, Ipswich. Another is at St James Cathedral in Bury. From the south, one is immediately struck by the elegance of the Y tracery in the Early English windows; but Roy Tricker thought them probably unauthentic, and dating from the 19th century restoration. The remarkable thing about this church, I suppose, is that it presents a rare opportunity to see beneath the skin of a medieval building. One can wander at will from one space to another, from the openness of the nave into the chancel, which was extended in the 1850s, free of the distractions of fixtures and furnishings. This was a substantial church which, in its present form, had a liturgical life of more than 500 years. Now, the birds sing, and the occasional visitor wanders. And, if there is little mystery left here, there is certainly a sense of continuity. The dead of Stanton who will spend eternity here are a touchstone to the past, just as much as the church. I wandered back towards my bike, struck by several heart-rending inscriptions for children. One, for a small boy who died in the early 1970s, recorded that his was a loving little life of sweet small works. As I stood and looked at it, and looked at the dates, I realised that if he was still alive today he would be exactly the same age as me, almost to the day.